1. 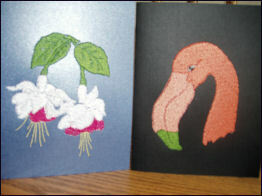 Purchase “card stock weight” paper cards/envelopes. 2. Hoop “Sticky Paper” in the appropriate sized hoop and remove the top layer. Be sure your design fits on the card measurements. 3. 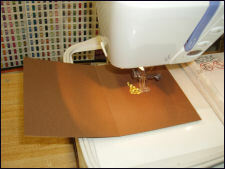 Secure the paper card onto the “sticky paper” in the correct position according to your cloth setter. The card is free of the hoop. 4. Slide a layer, two or three of stabilizer under the hoop – stabilizer touches the machine. The number of layers depends on the denseness of the stitching. 6. Remove the hoop from the machine. 7. 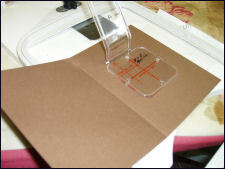 Remove the card from the hoop and trim stabilizer and “sticky paper" from the card. 8. Cover the stitched design with either some of the pretty scrapbooking papers or use “heat and bond” or other adhesives on a coordinating fabric. 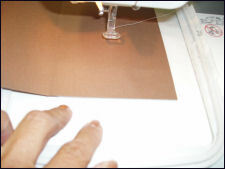 Glue the paper or iron on the fabric. This project was made by Kathy Lonergan. You are welcome to contact her at nattrka@aol.com if you have any questions.